These brand new wooden chess sets are the ultimate in outdoor chess. Made from tropical hard wood and available in varying sizes, this set is the showpiece of many parks, gardens and schools. Each piece is individually hand crafted, and with the process being totally natural each set is unique. 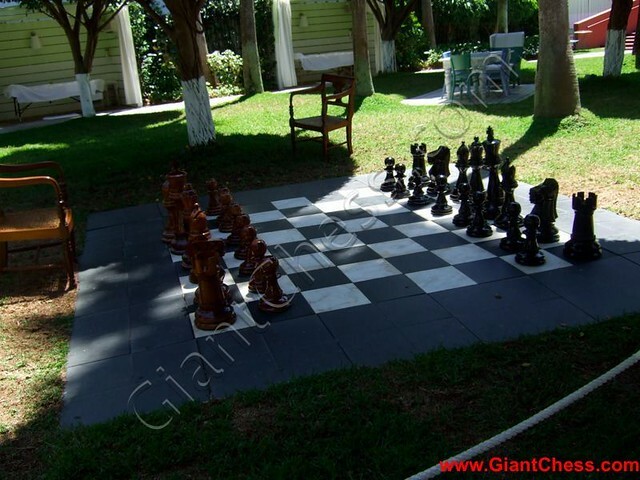 This chess set is the large standard size we produce. It is most often used for outdoor decoration, but can also be used for indoor decor. If you are shopping for a chess set, chess board, chess pieces, or anything chess, you have come to the right place. There is no larger selection of chess sets anywhere.